Automakers are pouring billions of dollars into fuel-efficient powertrains. But shapely sheet metal still sells cars -- which is why fresh design statements will be abundant at the North American International Auto Show next week. Hyundai and Kia, for example, promise to make a splash with the Hyundai Curb and Kia KV7 crossovers. Chrysler is trying for a more refined rear-drive sedan with the redesigned 300. And a Toyota Prius station wagon is scheduled to make its debut. Here is a roundup of world production and concept debuts planned for the show. The redesigned 2012 A6, a crucial car in Audi's strategy to boost U.S. sales, will be unveiled. The A6 takes styling cues from the redesigned A8 that went on sale in late 2010. Initially, only the 3.0-liter supercharged V-6 engine will be sold in the United States, but Audi also is considering the six-cylinder diesel. The A6 goes on sale in the second half of 2011. The second-generation 2012 BMW 650i convertible will debut. The car has new sheet metal. It goes on sale in the spring. A mildly freshened 2012 1-series coupe, convertible and all-new M coupe also will be shown. They also go on sale in the spring. Buick is expected to a show a compact car, which will be the smallest in its lineup. Chinese automaker BYD Auto Co. plans to show a plug-in hybrid SUV concept, the S6DM. BYD has shown the S6, a gasoline-powered version of the vehicle. 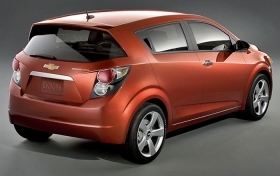 Chevrolet is expected to show the 2012 Sonic subcompact, which will replace the Aveo next year. The redesigned car, which will have hatchback and sedan versions, joins the Chevrolet Cruze and the upcoming Chevrolet minicar in General Motors Co.'s small-car lineup. The Chrysler 300 that debuted in 2004 was a distinctly American take on the rear-drive sedan, and arguably the most successful product of the DaimlerChrysler years. Chrysler is showing a more refined redesign. The 2011 car has a premium interior, with ventilated seats, heated and cooled cupholders and a power rear sunshade. To reduce noise, the redesigned model has new acoustic windshield glass, silencing foam and underbody insulating panels. The cars will arrive in showrooms in the first quarter. 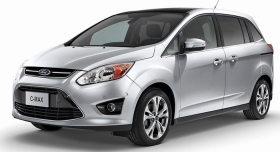 Ford will unveil the production version of the seven-seat 2012 Ford C-Max, a small alternative to a standard minivan. The vehicle shares the Focus platform and goes on sale in late 2011 or early 2012. The C-Max has sliding right and left rear doors. A 2.5-liter four-cylinder engine is standard. A 1.6-liter EcoBoost engine with direct injection and turbocharging is optional. Ford is also expected to reveal some alternative powertrain vehicles derived from the C-Max platform. Ford also will show a concept that will signal the design direction for the next-generation Escape crossover. GMC will show an off-road heavy-duty pickup concept that suggests bold styling for the next-generation Sierra HD. The GMC Sierra All-Terrain HD concept, previewed by GMC at a December media event, has a wide track, brawny grille and extra ground clearance. A restyle of the Sierra HD is expected in 2014 or 2015. Honda will unveil a concept version of the redesigned 2012 Civic, which arrives in showrooms in March. It is expected to have sportier styling than the current Civic. The 2012 Civic is expected to be about the same size as the current model. 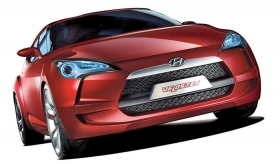 Hyundai will unveil the production version of its Veloster sporty coupe. The Veloster is a two-door hatchback powered by a 1.6-liter gasoline direct-injection engine producing about 140 hp with a fuel economy rating estimated by the company at 40 mpg. Hyundai CEO John Krafcik said the Veloster, scheduled to be released in 2011 as a 2012 model, will have the sporty driving dynamics of a Mini Cooper. Hyundai also will unveil the Curb crossover concept, which the company bills as an evolution of the "fluidic sculpture" design language seen on the Sonata mid-sized and Elantra compact sedans. 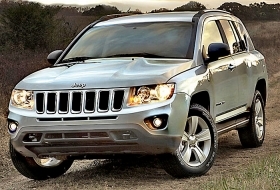 Jeep will show the 2011 Compass crossover, which is being built now but has not been unveiled at an auto show. Jeep is moving the Compass upscale. The sticker price, $19,995 including shipping, is $4,000 higher than the 2010 model. The Compass adopts styling cues from the Grand Cherokee's front-end design. All sheet metal was replaced from the A-pillar forward, plus the grille, headlight treatments and front and rear fascias. Gull-wing doors and swiveling rear seats could make the Kia KV7 concept one of the show's more interesting designs. A four-cylinder engine will return to the brand with the debut of the mildly freshened 2012 C-class sedan. The car's changes include new front and rear bumpers and lights and an instrument panel with a high-resolution color display. Mercedes is adding two direct-injection engines -- a turbocharged 1.8-liter four-cylinder with 201 hp and a 3.5-liter V-6 with 302 hp -- as well as a redesigned seven-speed automatic to the C-class sedan. The car goes on sale in July. 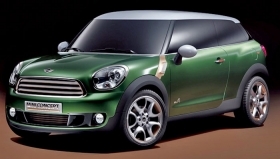 Mini will introduce a two-door concept crossover called the Paceman. The concept has a larger tailgate than the Countryman, Mini's first four-door that goes on sale early next year. It also has what Mini calls a "coupe tail" to give it an athletic appearance. The company will show the 918 coupe concept, a racing version of the 918 Spyder revealed at the 2010 Geneva auto show. Sources say it has a plug-in hybrid powertrain with a V-8 and three electric motors. The newest entry into Toyota's Prius family will be a 2012 wagon. Because the current Prius is a shallow-raked hatchback, little physical change is expected for the wagon, other than a flattening and extension of the roofline. According to filings with the U.S. Patent and Trademark Office, the 2012 production vehicle will be called Prius v.
Perhaps more important with the Prius v unveiling is the technology, so far undisclosed, that's under the sheet metal. Toyota has been testing plug-in hybrid technology, as well as its version of a lithium ion battery. Also, Toyota will unveil a concept version of a Prius-based vehicle. Volkswagen will show the production model of the new mid-sized sedan designed for the United States. The 2012 car will be built at VW's new factory in Chattanooga, Tennessee. It goes on sale in the second half of 2011.